One of my passions is mentoring, and over the years I have been involved in many different mentoring positions. I think it stems from me being the first-born child in my family. Having blazed a trail for my siblings I try not to be overbearing towards them as they forge their own paths in life. There are so many things I wish I was told growing up and every so often I'll drop a bit of advice to them. I believe mentoring ties directly to being a role model and that you can mentor someone from afar. Oprah is an example of someone who I think does this beautifully. She is always self-deprecating and let's her viewers know she's in the struggle with them no matter what challenge she's facing. I think that's what makes her so successful and likable. 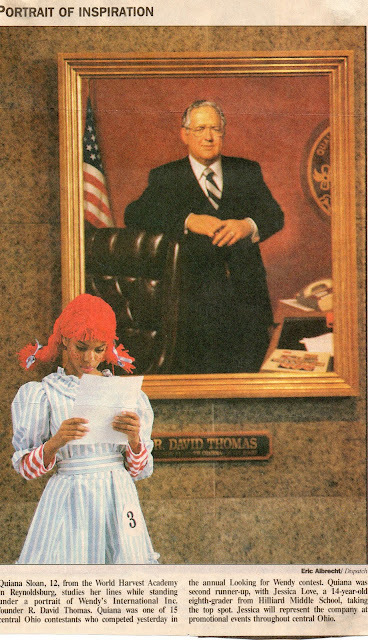 In the 90's, Wendy's International, which is based in Dublin, Ohio, had their annual "Looking for Wendy" contest where they sought out the next "Wendy" who would represent the company locally at community events. I don't remember how I found out about the contest, but I decided that I should enter. I figured that if Wendy's is an international company then they can be represented by a person of color. What was interesting is that no black girl had done this before in all the years of the contest! The first year I competed I made 2nd-runner up and two years later I was 1st runner-up. I never won the actual title, but when I later went back to help run the contest I was so excited to see black girls coming to sign-up. I hope I was able to inspire them, and during the contest I made it vocal to the media that I really wanted to set an example. 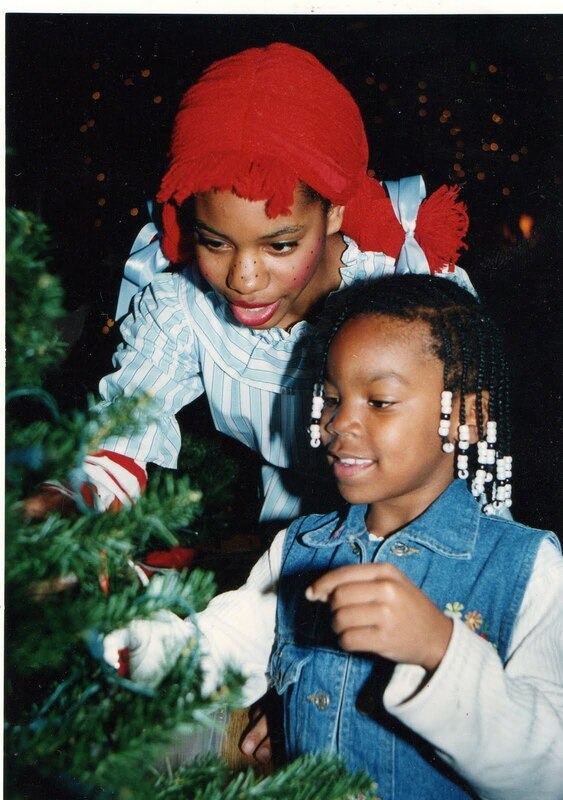 This was really my first start at mentoring! When I got to college I got involved with helping to teach kindergartners how to read through Wellesley Words on Wheels. I absolutely LOVE reading, and it was so much fun to share my passion with kids. This was also the start of linking up with tutoring programs. After college, I had the opportunity to be a resident tutor for 2 1/2 years at Wellesley's ABC program. I lived with 6 high-school girls and a resident director and led study hours Sunday-Thursday nights. It was more than tutoring as I came to see the girls as my little sisters. They're all women now and they make me very proud! I am still very much in touch with them and three of my "little sisters" even came to my wedding last summer. We had so much fun! It's so funny to think of how we all started out together and they would joke around saying "Someday we'll come to your wedding!" and they actually did! I learned so much from being a part of the ABC program and this was the most memorable part of my post-college experience in Boston. I can't wait to see what life continues to have in store for the ABC women! Another wonderful organization I was a part of is POSSE. One of my ABC students went on to become a POSSE student and graduated from Bryn Mawr this spring. As part of POSSE's writing program, I was trained in becoming a writing tutor and worked with a POSSE student who was about to enter college as she honed her writing skills. Although it wasn't an in-depth program like ABC, it was good to foster a one-on-one relationship with a student which prepared me for my New York mentoring experience. Once I got to New York I was so surprised to see many of my peers lack of involvement in volunteer programs yet the needs in NYC and the opportunities to fulfill them are abundant. I had a hard time selecting which program to become involved in and ultimately selected LSAFHS which was looking for mentors to work with junior high school girls. It's a very intimate program that required a year long commitment and there were a few Wellesley alums involved as they had posted the listing in our e-mail newsletter. I was paired with a student who turned out lived a block from my good friend, and former Wellesley roommate - what a coincidence! We would go on monthly outings exploring different places around the city and it was so much fun to kind of be a kid again. We went to different museums, performances, parks, and I taught her how to knit (she's wearing the hat we made together in the picture above!). While I couldn't commit another year with the wedding and then baby on the way it's a program that I highly recommend. While I'm currently on hiatus from mentoring in the formal sense, I always look for opportunities to help young girls and women who are coming up behind me. I remember once I struck up a conversation on the subway with a young woman interviewing for a new job. She was there for the day from the south and it turned out she was trying to break into advertising. I gave her my business card and told her to contact me and she did. We had an e-mail conversation where I was able to give her a few good leads and resources for her job search. Mentoring definitely comes in different forms, and I encourage our readers to find an opportunity to give back in your community. It's really a lot of fun! What a great way to motivate! Since I'm big on time I was looking for a flexible organization where they require once-a-month meet-ups and once a week e-mails. I can handle that! It's called imentor and its based in NY so if you know any other professionals looking for a mentorship position, I would strongly recommend that company. @Tracita Linda (Tracey) Thank you for the recommendation! I'll bookmark it.